Follow an essential signpost to the present from the past with a subscription to History Today magazine.Every issue is packed with intelligent writing and is a visual and literary feast of well-written features, absorbing analysis and fascinating images.History Today magazine is world's longest running history monthly and has been published in London since January 1951. 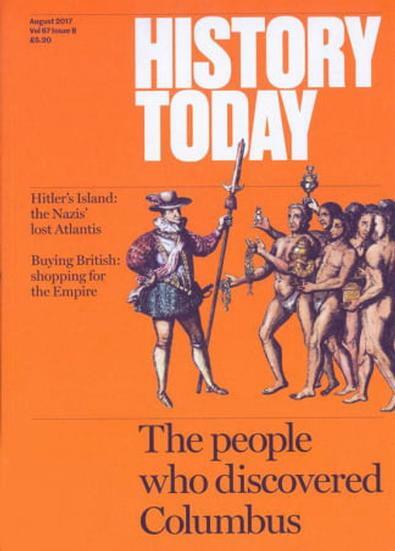 History today includes fascinating articles and extensive features on all historical events from all around the world, during different periods in time.Written by leading scholars and researchers, History Today Magazine is a pleasurable read for everyone who has an interest in world history. This beautifully illustrated magazine also comes with extensive book reviews film reviews and website links for you to enjoy. Never feel like you have missed out on the past, with a magazine subscription to History Today. I have read this magazine for nearly ten years and believe it is the best history magazine available. The articles provide in-depth analysis and cover a broad range of international history topics. The magazine is a great price on I subscribe.